Newly independent South Sudan has announced a series of measures to combat corruption. 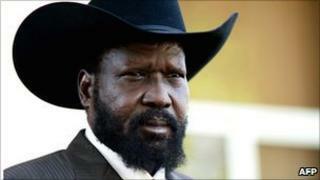 President Salva Kiir detailed "five critical steps" in an open letter. Land sales will be reviewed, public contracts subject to new laws and officials will be expected to publish their assets and earnings. The announcement comes ahead of a meeting with US President Barack Obama at the UN and follows local and foreign pressure to tackle the problem. South Sudan only became independent in July, but its leaders ran a semi-autonomous region with a large budget for six years before that. President Kiir said cases where money has apparently been stolen will be investigated, and the results made public. He specifically mentioned a high profile scandal involving sorghum, a local staple food. Senior advisers from other African countries will be appointed to key institutions, and the anti-corruption commission will be strengthened, the president said. South Sudanese civil society organisations and journalists and Western governments have been vocal in their criticisms of the extent of corruption in South Sudan. The BBC's James Copnall says the timing of Mr Kiir's announcement suggests that he wants to show his good intentions before his UN meeting with President Obama, which is of great significance for South Sudan. The south's independence followed decades of conflict with the north in which some 1.5 million people died. South Sudan is rich in oil, but is one of the least developed countries in the world. One in seven children dies before the age of five.